The median weekly wage first increased during the recession, from $673 in 2007 to $690 in 2009. That is likely due to the fact that less-skilled workers are typically let go in greater numbers during recessions. But wages have fallen during the economic recovery, a not unexpected consequence of the enormous slack that continues to exist in the labor market. The median weekly wage fell as low as $668 in the fourth quarter of 2011 and was still at the pre-recession level at the end of 2013. The earnings of Hispanic workers are currently a little bit higher than what they were in 2007. For full-time Hispanic workers, the median weekly wage in the fourth quarter of 2013 was $570, compared with $556 in the fourth quarter of 2007. It had risen to $593 in the fourth quarter of 2009. Following the same up-and-down pattern, the weekly earnings of part-time Hispanic workers rose from $222 in 2007 to $242 in 2009, and then settled at $225 in 2013. Although the wages of Hispanic workers are estimated to have risen since 2007, this may not be a sign of real economic progress. Consider, for example, the earnings of U.S.-born Latinos. 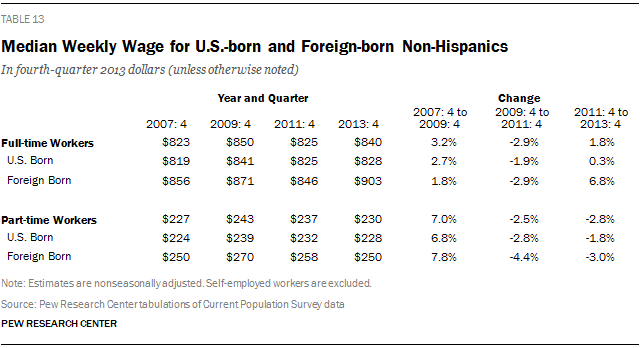 Among U.S.-born Latinos working full time, median weekly earnings fell from $684 in 2007 to $640 in 2013, a loss of 6.4%. The weekly wages of U.S.-born Latinos working part time dropped from $214 in 2007 to $204 in 2013, a loss of 4.5%. Meanwhile, wages of Latino immigrants, both full-time and part-time workers, were unchanged. So why did wages for Latinos overall increase from 2007 to 2013? The answer, most likely, is in the changing composition of the Latino workforce. As noted earlier in this report, the immigrant share of the Hispanic workforce has fallen steeply since the start of the recession, from 55% in late 2007 to 49.7% in late 2013. Because Hispanic immigrants earn less than U.S.-born Hispanics, their retreat from the U.S. workforce raises the estimated earnings of Latinos overall. The slowdown in immigration may have raised the floor on estimated earnings of Latinos via another channel. With replenishment from new arrivals easing up rapidly, the median age of the Hispanic immigrant workforce jumped from 37.6 in 2007 to 41.3 in 2013.19 Because earnings generally increase with age, the rise in median age may be disguising an underlying drop in the earnings of foreign-born Hispanics. The earnings of non-Hispanic workers also increased during the recession and then decreased in the first two years of the recovery. This was true for both full-time and part-time workers. But the script for full-time and part-time workers diverged in the past two years. From 2011 to 2013, full-time non-Hispanic workers recouped some of the losses they experienced from 2009 to 2011, but the earnings of part-time non-Hispanic workers continued to decrease. Among full-time non-Hispanic workers, earnings in the fourth quarter of 2013 were at least as high as what they were in the fourth quarter of 2007. For all full-time non-Hispanic workers, the median weekly wage increased from $823 in 2007 to $840 in 2013, or by 2%. Meanwhile, the median weekly wage for U.S.-born non-Hispanics moved from $819 to $828, and for the foreign born they increased from $856 to $903. It is possible that the stronger gain in earnings for immigrants signals a more selective inflow of immigrants. Wages for part-time non-Hispanic workers fluctuated during the recession and the recovery but ended up unchanged at the end of the six-year period. For all part-time non-Hispanic workers, the median hourly wage in 2013 was $230, virtually the same as its level in 2007. The same is true for U.S.-born and foreign-born non-Hispanics, whose weekly earnings in 2013 were $228 and $250, respectively.